Something wonderful will happen here in July. In fact something so surprising and unprecedented that we can only wonder what other fabulous and sane undertakings might emerge here. East Avenue is an important thoroughfare in Rochester, and has been since the beginnings of the city. Tree-lined and beautiful, East Avenue is Route 96, and carries a lot of traffic into and out of the city every day. In July, a long segment of the Avenue, from Alexander Street in the west to Culver Road in the east, will go from four lanes to two lanes. Amazing! 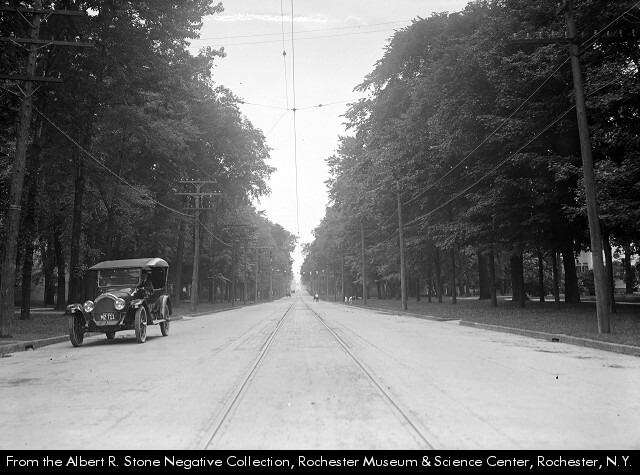 This segment of the street is home to Eastman House, the Rochester Museum and Science Center, and some of the great homes – mansions really, and now mostly non-profits, clubs and condos – from the golden age of the city. It is a great street to stroll, and but for the traffic and the narrowness of the existing four lanes, a great street to bike. At last East Avenue will become a complete street – good for peds, bikes, cars, and perhaps one day again, trolleys. The city is using federal money to repair and restripe the Avenue, and because it’s only a fixer-upper, City Engineer Jim McIntosh didn’t have to go to the City Council, or the public. He rightly observes that the Avenue will be much safer when rearranged – it’s a doozy now, because of the narrow lanes and potholes and drains at curbside. Thanks, Jim!! Keep it up. Oh, and while you’re out there this summer, stripe a bike lane in each direction and we really will have a complete street. The most fun of all as this unfolds is to listen to the whining and griping and moaning of suburbanites and car commuters. Car folks are decrying this change in huffy language that is really quite hysterical. It’s a tiny, tiny victory for sane urbanism, but we’ll take it. Our home place here is in the midst of considering a change to its transit system. As usual, Rochester is the perfect case study of how cities can screw themselves up with the greatest of ease. My newly adopted city, like so many of its sister places, has made a vast litany of urban gaffes over the last century, and we are about to see yet another. Let me explain. By the mid 1950s, everything was gone. Streetcars gone. Interurbans gone. Subway gone. Left on the roads? Cars, and buses. Retail was headed out of town, following all those who began to sprawl. Downtown’s fate was sealed. 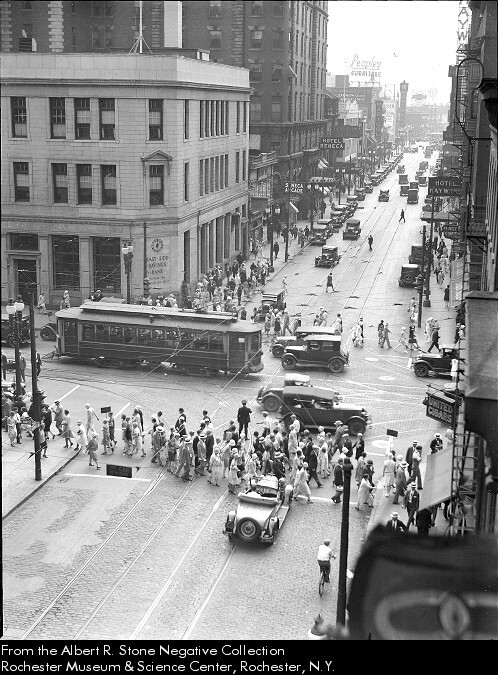 So Main Street became a busway, with a lane for them and a lane for cars. 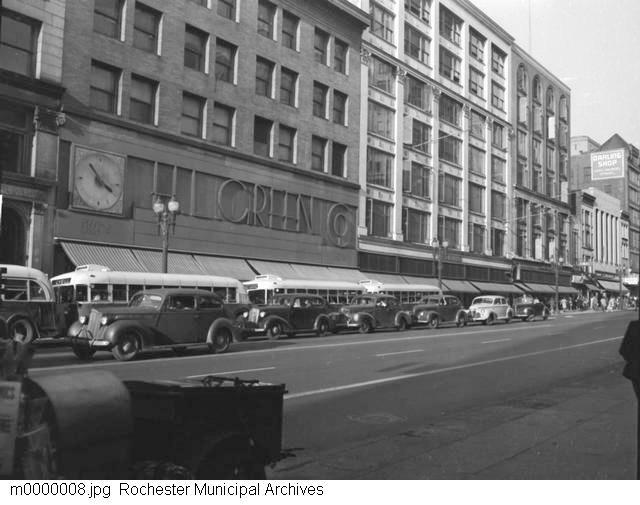 As transit somehow managed to persist after WWII, Main Street became home to lots and lots of buses. Our local transit agency, RGRTA, devised a hub-and-spokes operating system that assured that there would be tons of buses downtown. If you want to go from any point in the region to any other point, you have to go downtown first, then transfer to another bus that will get you close to where you are going. Annual ridership in the overall system is pegged at about 17,000,000. This works out to about 46,000 riders a day. In a region of well over a million people, this is about four percent. Of course the transit provider cooks the books to get ridership numbers that seem much higher. What they do is focus on city riders, which of course are a much higher percentage of the population. This makes RGRTA look good, and rank higher than expected in national ridership ratings. 36th in the U.S.? Really? And while this yo-yo method provides low-quality transit service to citizens, it appears to be economically efficient. RGRTA likes to crow about how well it’s doing financially. Crappy, infrequent service that doesn’t go where you need to go, when you need to go there, but hey, a money-making proposition. And the only transit game in town. Word has it that some of our leaders realize that the yo-yo thing is pure madness, but no change to the operating system is being planned. In fact, if you read RGRTA’s strategic plan (you have to be up for this one – 337 pages), you see that during their SWOT analysis (strengths, weaknesses, opportunities, threats – old-fashioned strategic planning methodology) the hub-and-spokes routing system squarely makes the list of weaknesses. Then they say nothing more about it. Anyway, on to the story of the moment. As an out-of-town transit geek, all this makes me cranky – what a ridiculous way to provide transit. But onward. 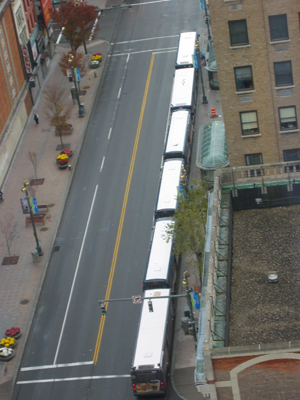 So we have tons of buses on Main Street now. Take a look at this. Main Street today, image pinched from Mike G. at rochestersubway.com. Here’s the story. A project was being planned for downtown. This was going to be “The Big One,” Renaissance Square. The project that would save the city. And as part of the project, a new bus terminal would be constructed, getting the whales off Main, and even providing for curbside parking! More parking!! Hoorah! Just what we need! Never mind that this project was not near the heavy rail station – Amtrak and intercity bus, and we hope sometime soon high-speed rail – where it belongs. Never mind that half of downtown, including lots of space near the heavy rail right-of-way, is empty. It’s time for Renaissance Square. And curbside parking on Main. Well needless to say, the project went belly up. Caput. And now there is about $52 million in leftover state and federal funds burning a hole in the municipality’s pocket. So what to do? Build the bus transfer station anyway, and smack in the wrong place, on a street called Mortimer. Which solves nothing. We still have the yo-yo bus system. If we changed how the system is routed, we would not need a downtown bus terminal at all, and we might even be able to get where we’re going in a realistic trip time. 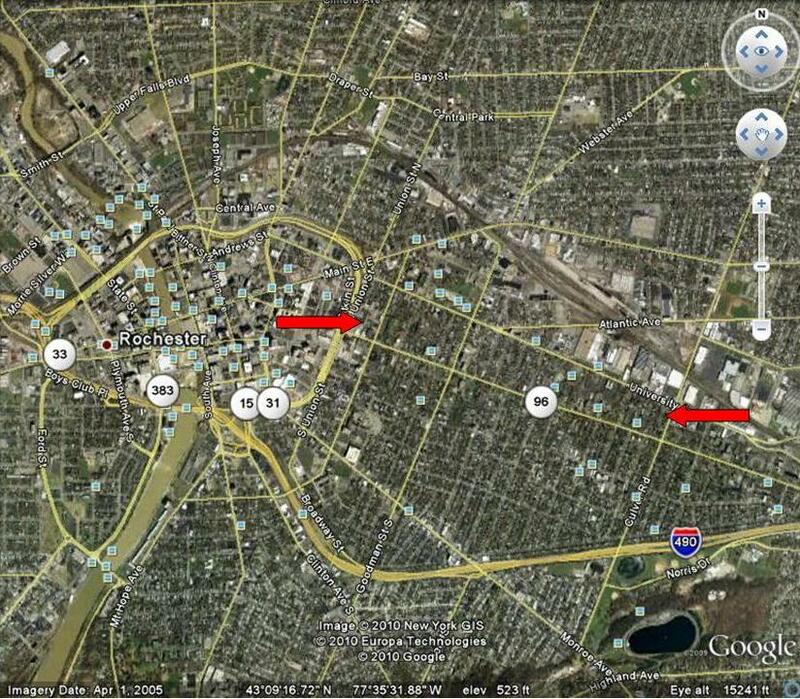 But even if we keep the hilarious yo-yo system, the terminal should be near other modes of transit, where it belongs. Logical, yes? Maybe it’s just me. City leaders tell us that if we don’t move quickly, and don’t spend the leftover federal and state dollars, we’ll lose the cash, and the chance to spur a redevelopment of Main. But hey folks, we all know that getting buses off of Main is not going to magically repair a few decades of abuse. It will take more than getting rid of buses, methinks. And then there are the disturbing undertones to this discussion: getting rid of the buses gets rid of crowds of “them” on Main. The others. People who are different – by race, class, age, attitude. Urban folks. The ones who really use, and need, the system. So what should we do? Build a bus facility at the heavy rail station, to interconnect modes. 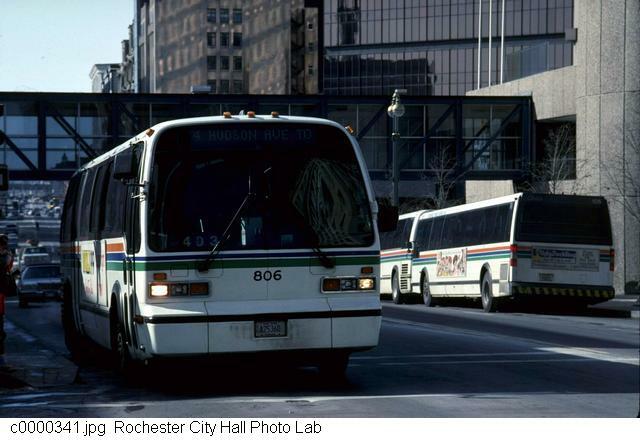 Change the bus routing system from yo-yo to we-go. Then take the savings and build a football stadium. After all, Rochester calls itself the best minor league city in the nation. Sad, but true.